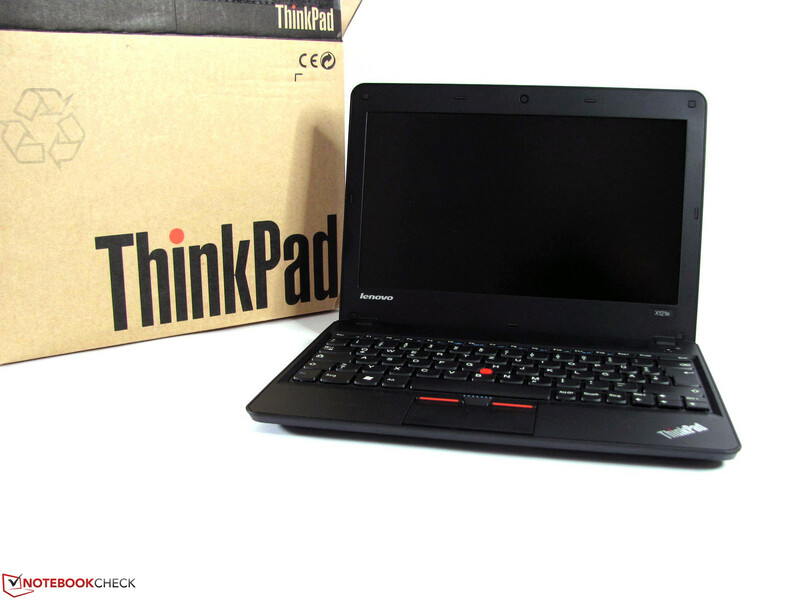 The ThinkPad X121e is the successor of the ThinkPad X100e and should be able to do everything a little bit better. Longer battery life, less heat generation, rounded off with more performance are the basic goals. 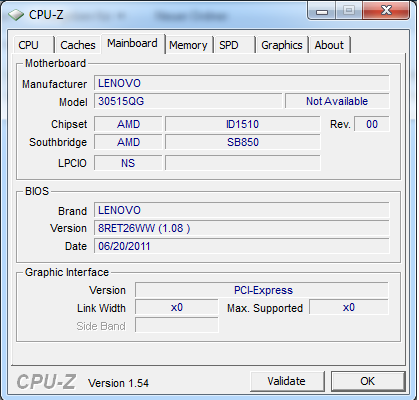 With the current model, you can choose from several CPU models. 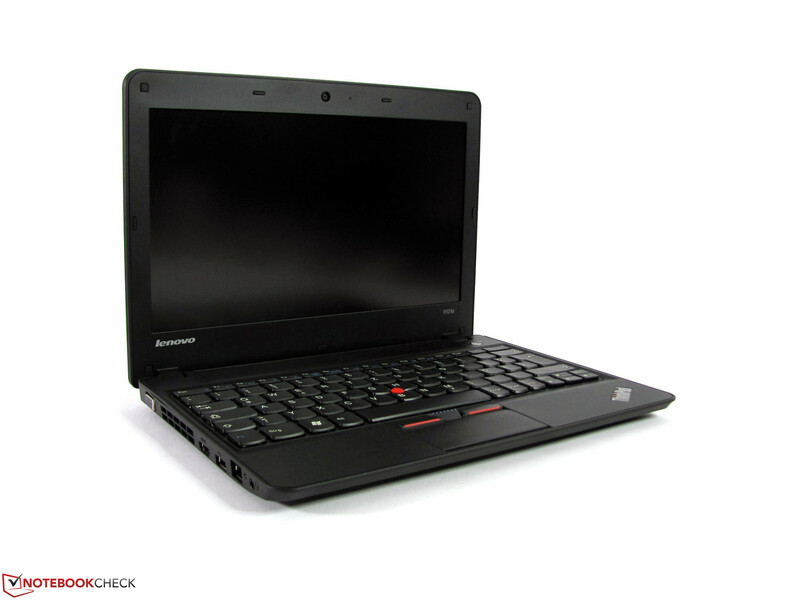 While the X100e was only available with AMD processors, you can now also pick an Intel Core i3-2357M CPU. This Intel version has already been tested by our U.S. editors. 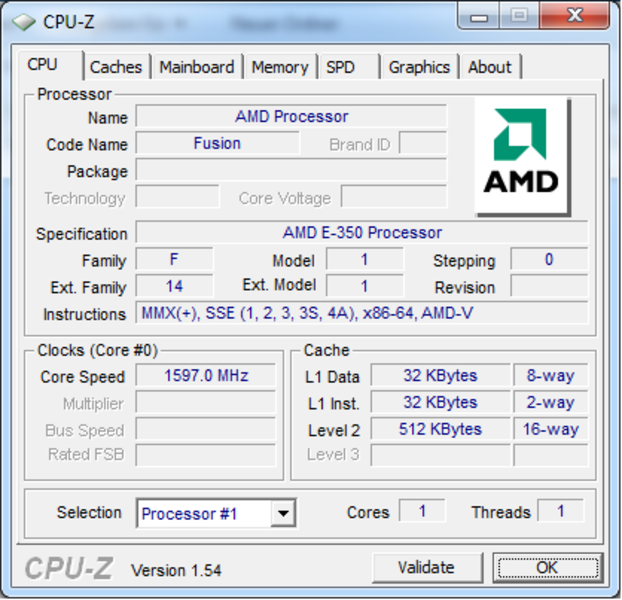 We have here the AMD version with a Fusion E-350 CPU with its integrated Radeon HD 6310. 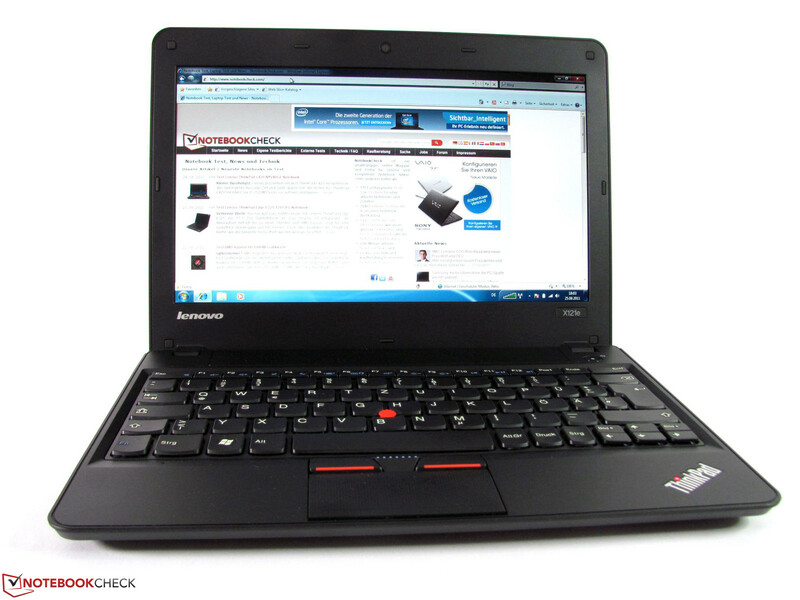 A further alternative is available with the AMD C-50 CPU and a HD 6250 GPU, which can be configured in Lenovo's Web-Shop. 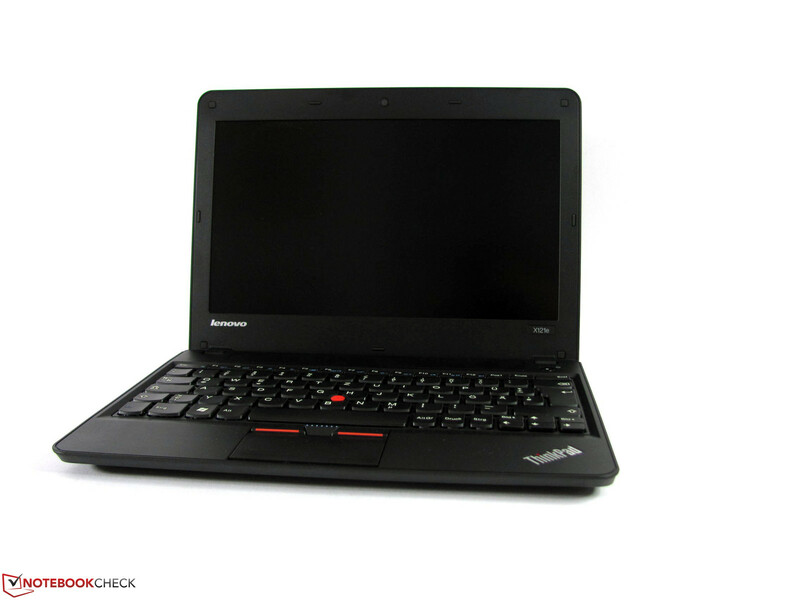 Further appointments of our test model are comprised of a matte 11.6" display, a 320GB hard drive and 4GByte RAM. The unit comes without operating system, reducing the cost to a particularly low 370.- euros. The look of the small X-series entry level notebooks fits perfectly into the line's concept. 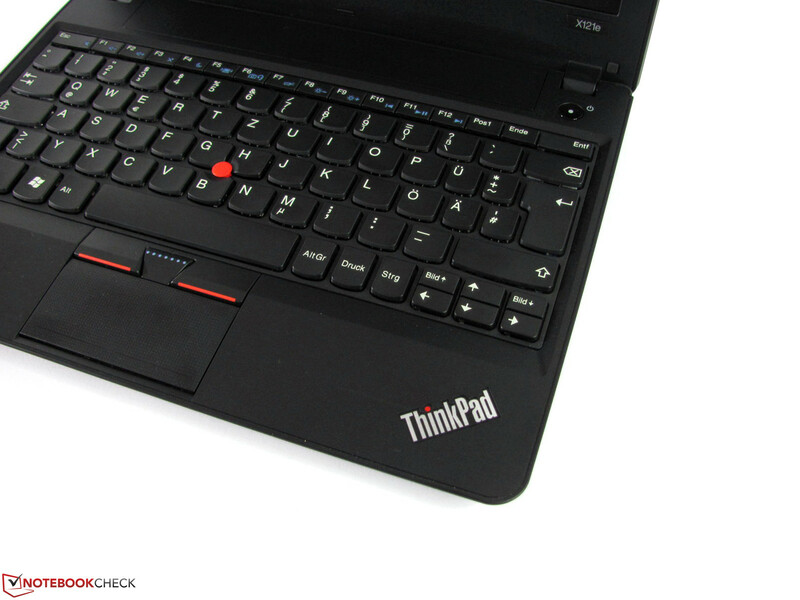 Design gimmicks are absent, the case is as sober as ThinkPad aficionados prefer. The black textured plastic gains a little highlight with the familiar red elements of the track point assembly. If the red display variant will be liked by the existing patrons will depend on individual taste. 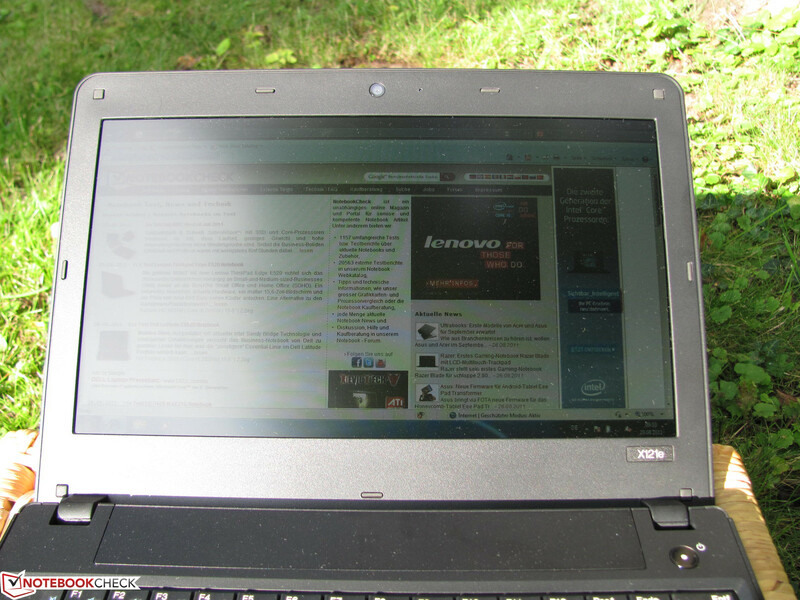 Pictures of this version can be seen in the test of the ThinkPad X121e with Intel CPU. While the look of our test unit is alright, one has to accept a number of drawbacks in regards to case quality. 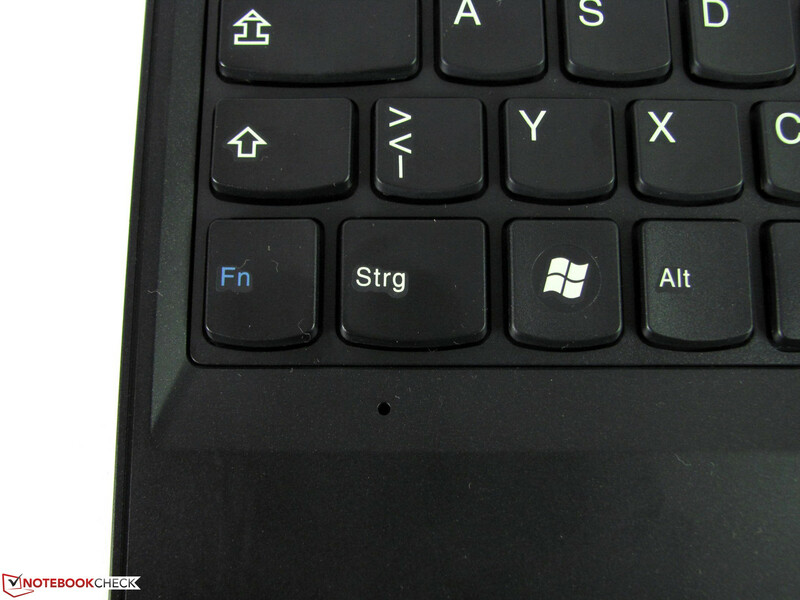 The wrist rest is generally firm, but can be noticeably depressed when clicking the touch pad buttons. 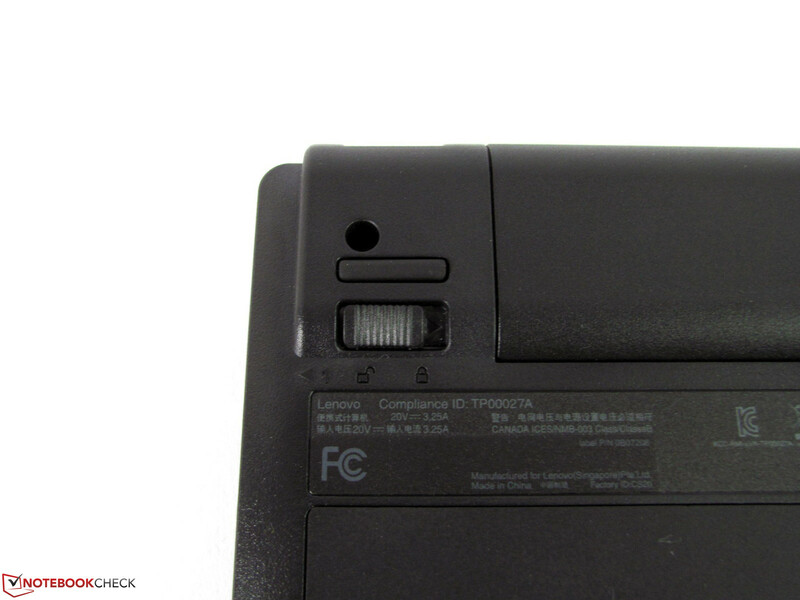 A further weakness is the large cutout for the battery at the rear. Here, it is possible to flex the housing by pushing and pulling, causing creaking sounds here and there. At least, the battery fits almost perfectly and has minimal play. The hinges hold the display properly in position, and the display lid makes a solid impression overall. The bottom is also sturdy, in spite of a large access cover, and only gives with stronger pressure in narrowly localized spots. All relevant components are easy to reach, thanks to the large access cover. 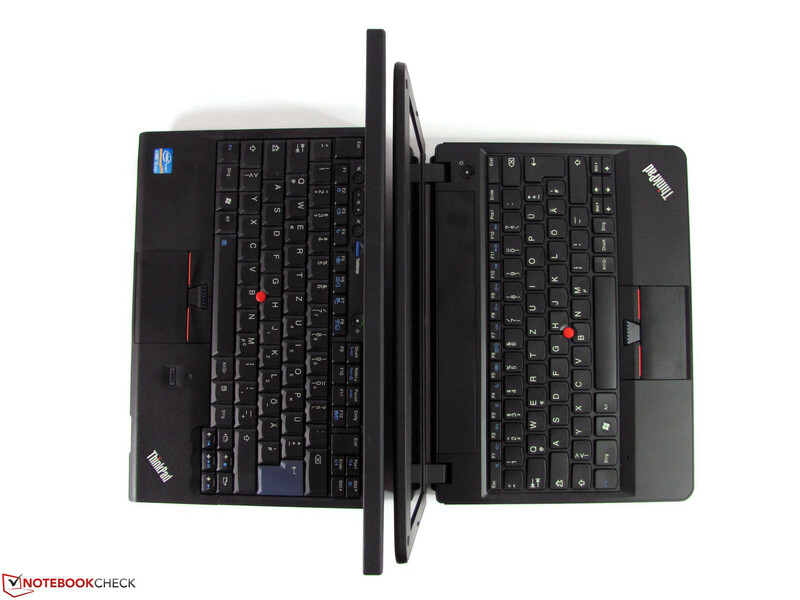 Removal of keyboard and wrist rest to add a UMTS module, for example is unnecessary. 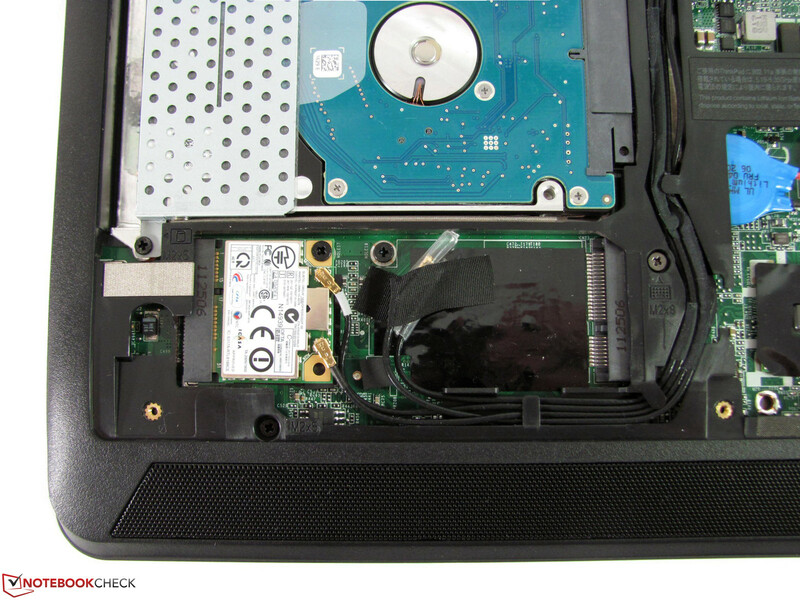 Hard drive, RAM and wireless modules are easy to exchange after removal of 3 small screws. 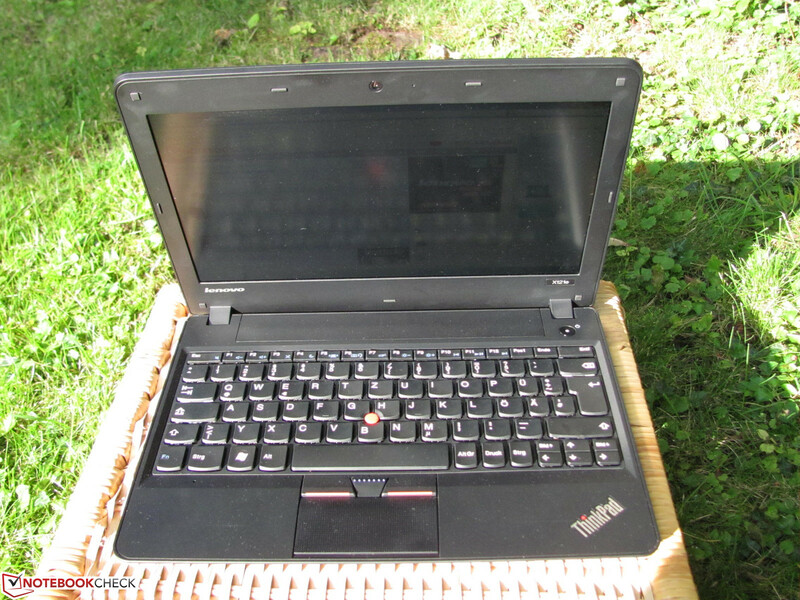 For a notebook in this price range, connectivity options are well appointed. 3x USB 2.0, HDMI 1.4, VGA, Gigabit-LAN, WIFI 802.11 b/g/n, Bluetooth 3.0, a combined audio port, Kensington Lock attachment, a 4-in-1 card reader and a VGA WebCam make for a good basic equipment level. 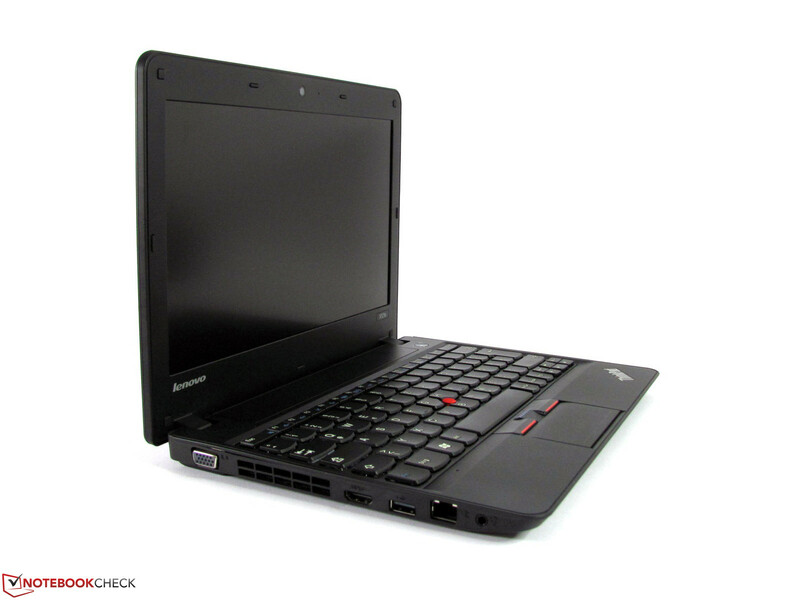 While all models are prepared for UMTS modem, the otherwise available finger print reader currently can't be ordered for AMD versions of the notebook in Lenovo's online shop. 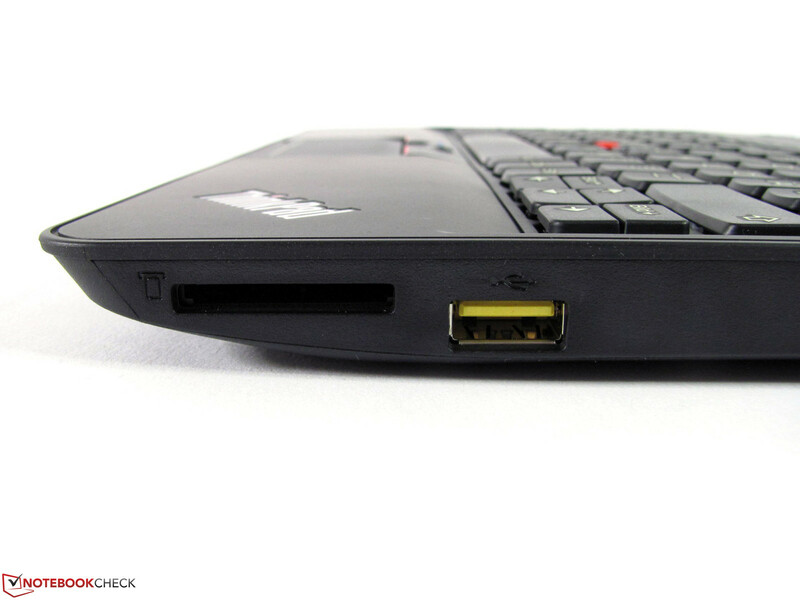 One of the USB ports on the right side has a yellow marking and can be set up in the BIOS to allow charging of external devices, even when the notebook is turned off. The placement of connectors on the left side of the unit is not optimal. 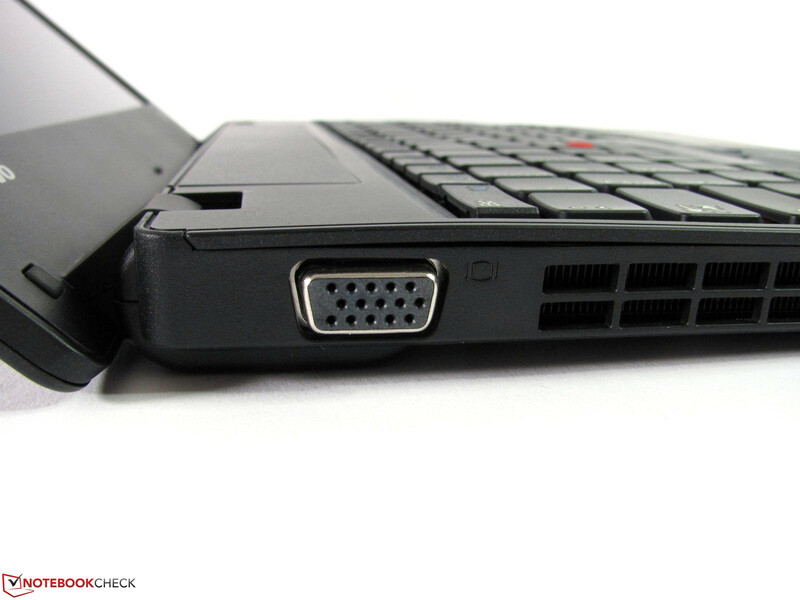 LAN and HDMI are placed toward the front, which interferes with freedom of movement even for right handed users. 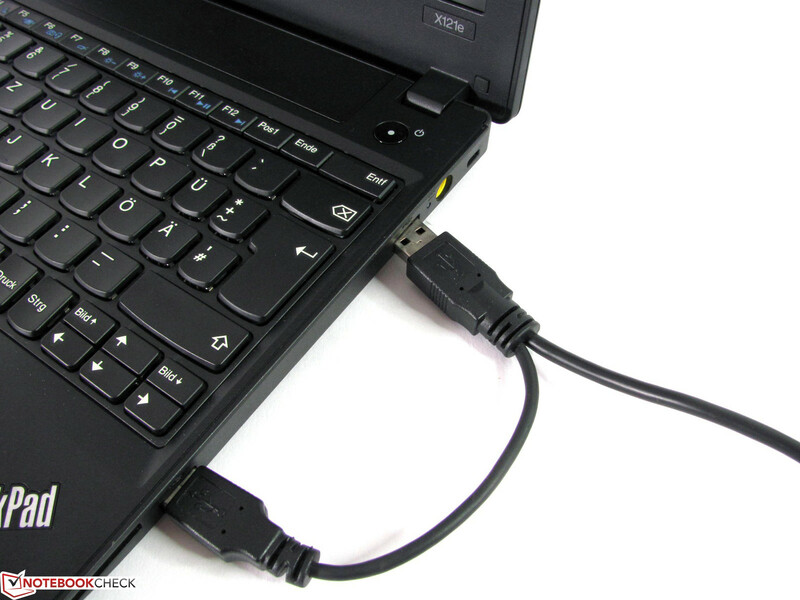 The USB connectors are spread out nicely over both sides, but are spaced too far apart to plug in a Y cable on the right side. 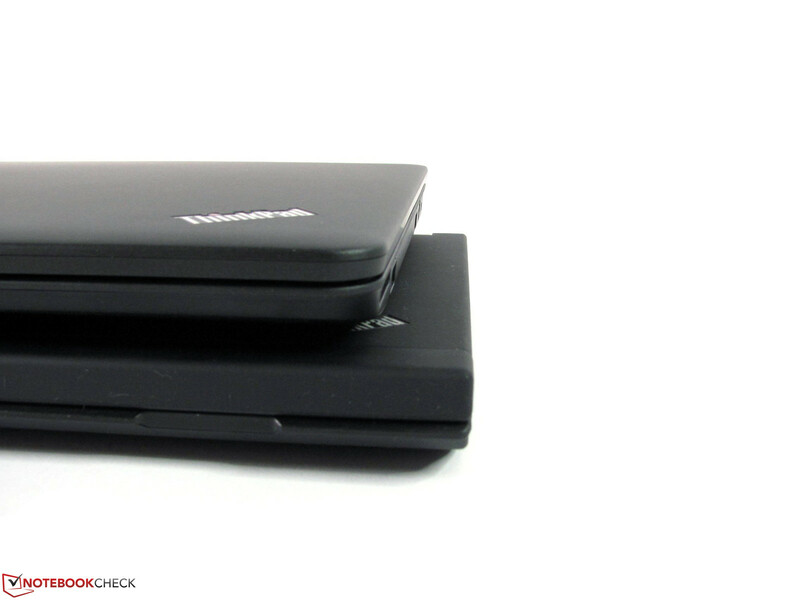 External DVD drives use Y cables to achieve a stable, sufficient supply of electricity. The USB ports provided a maximum 25.7 MB/s transfer rate in our tests, and the 4-in-1 card reader could read data at 20.3 MB/s. The analog VGA signal gave an astonishingly good image quality on our 1280x1024 pixel NEC monitor, and so offers the ability to continue to use older displays without digital signal input. 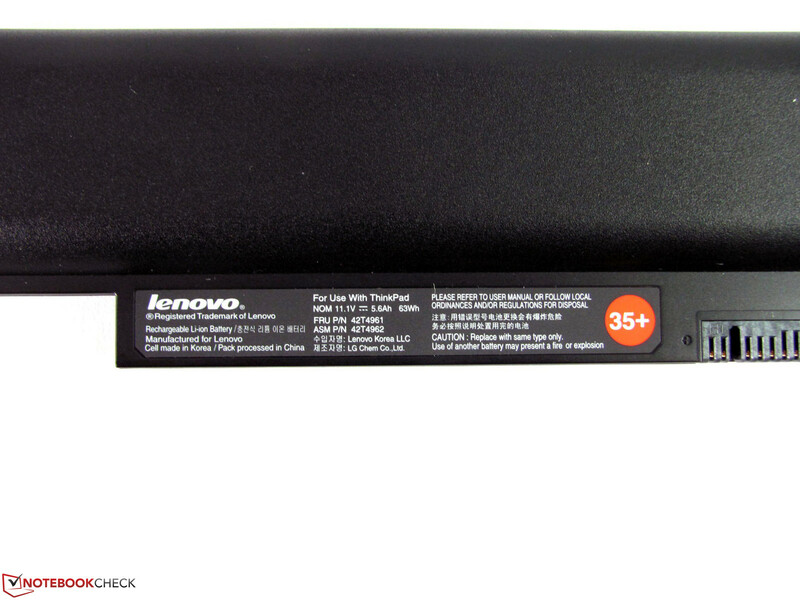 A connector for Lenovo's docking stations continues to be unavailable. 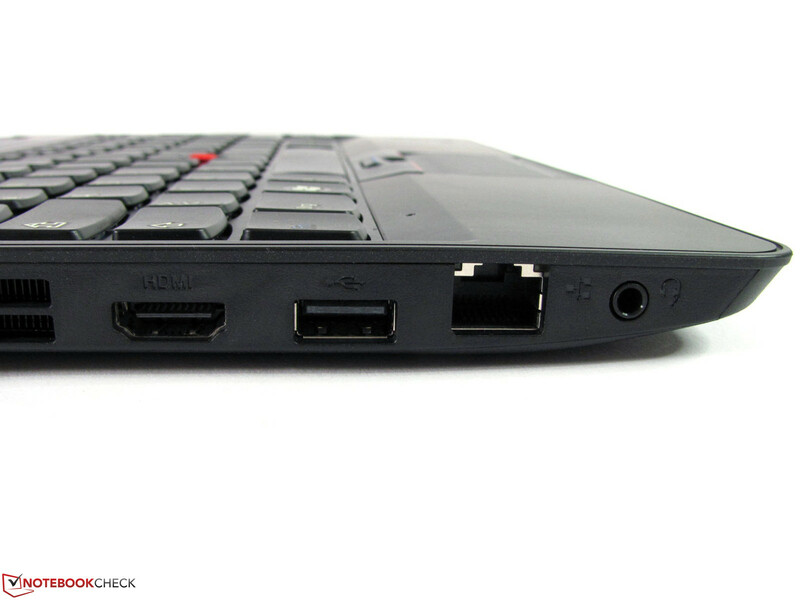 Only the USB versions from Lenovo or third party vendors (for example Kensington K33926EU) can be used. Basic manufacturer's warranty lasts 1 year and the usual variations of warranty and support upgrades are available. 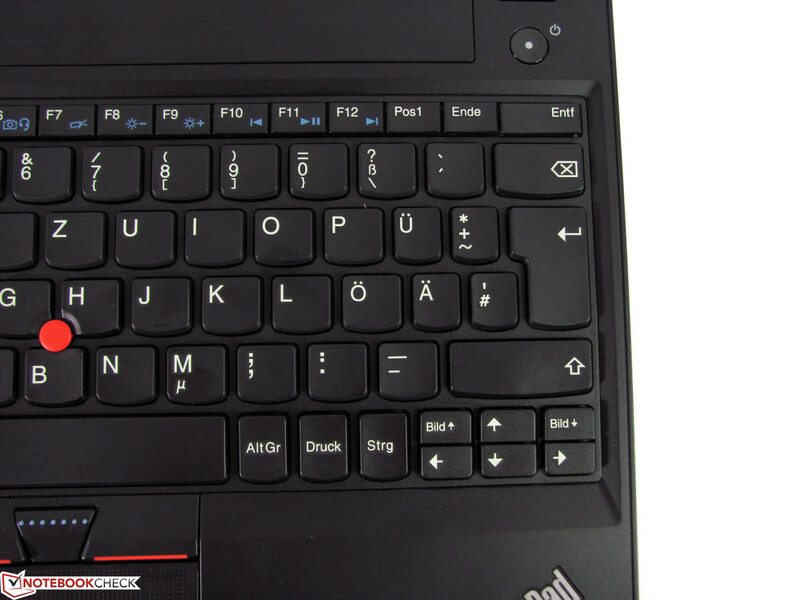 The keyboard sports a chiclet design and offers fullsized keys in a 19mm grid. Often used keys like Return, Del and Esc are sized sufficiently large. Especially the larger keys stand out from the otherwise muted sound of key presses and produce something of a rattle. The smooth F-Keys are a pleasure to use and proove that it can be done better. 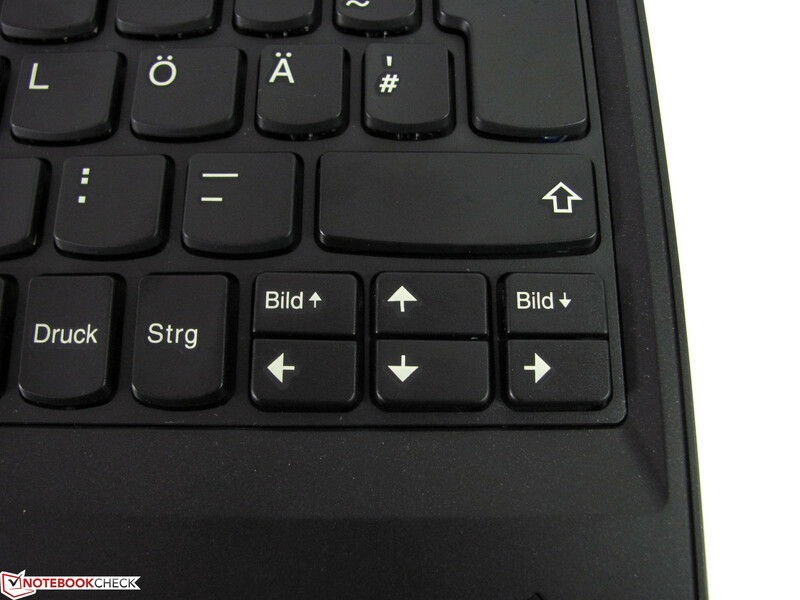 The page-up and page-down keys are unfavorably close to the arrow keys. This leads relatively often to typos, because the spacing relative to key size is just too small. 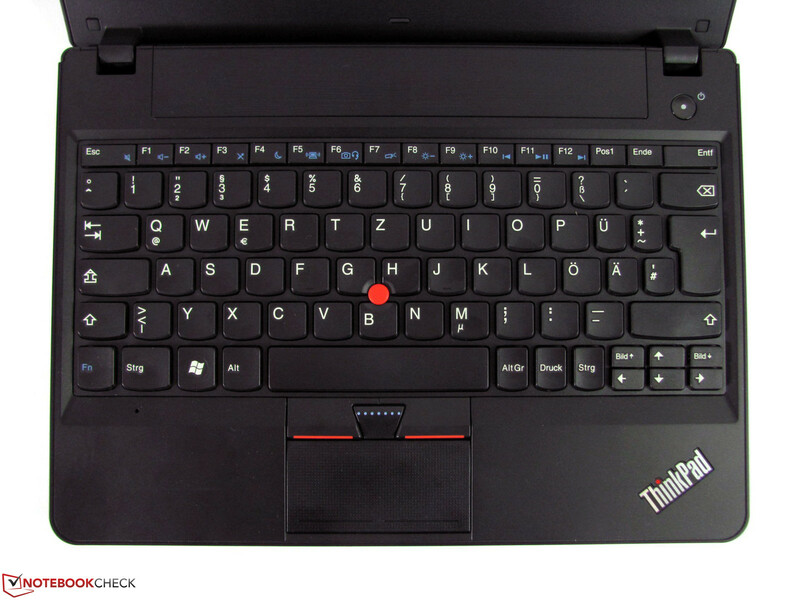 As usual with ThinkPads keyboards, the CTRL and FN keys are reversed in position. This positioning can be changed in the BIOS, at least as far as function goes. 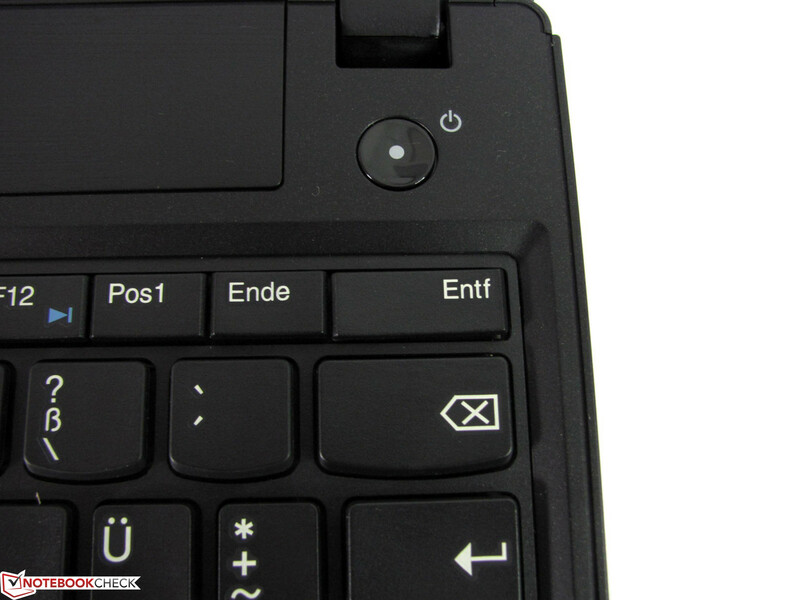 Unusually positioned is also the "Printscreen" key, to the right of the space bar in the lower part of the keyboard. 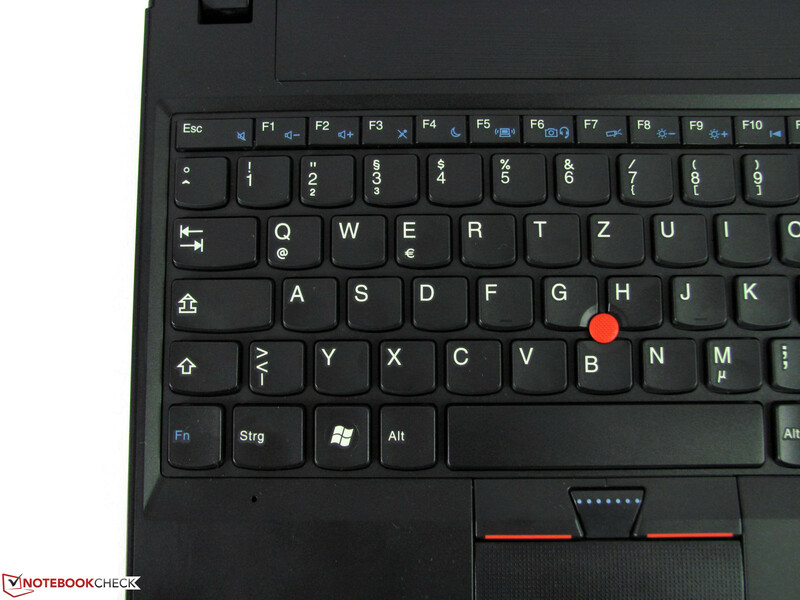 Overall, the keyboard is stable and sports short key travel, but on the left side, it can be pushed down a bit, and produces a very slight springy response. 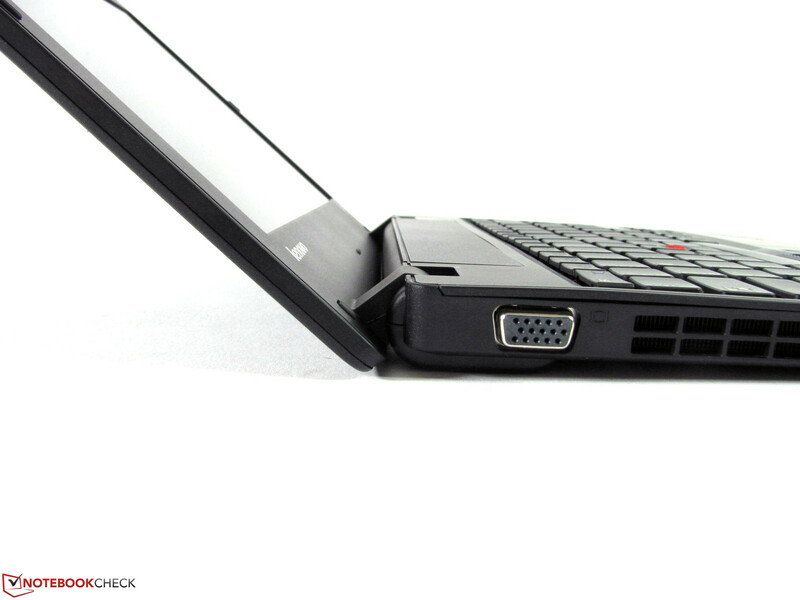 The touchpad is sufficiently sized, sports the familiar textured surface and is nicely separated from the wrist rest. The unreliable detection of finger taps, however turned out to be very annoying. On double tap, the cursor almost always jumps or fails to register and thus leads to frequent mistakes. Changing the settings provided no relief. A possible solution could be the installation of alternative Synaptics drivers, which we did not test though. 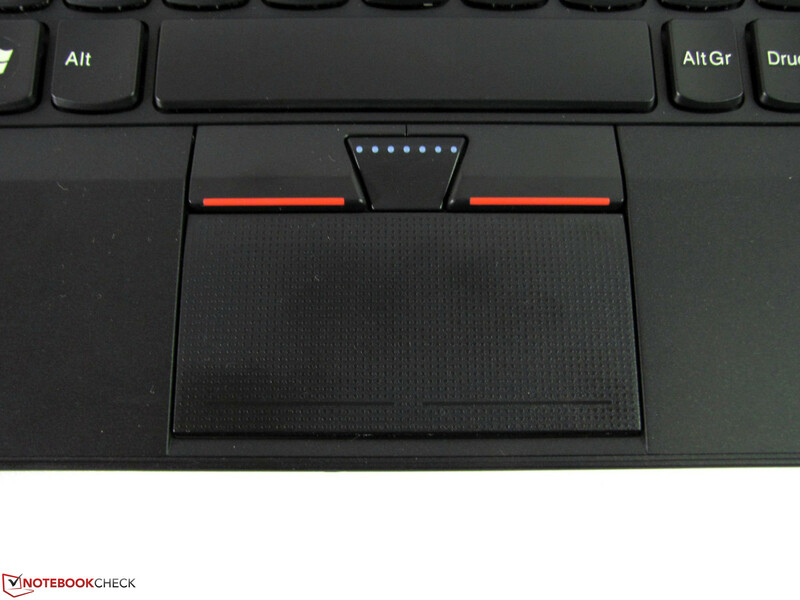 If you use the touchpad itself as a mouse button, you end up pushing down the entire wrist rest considerably, because the structure beneath is not sturdy enough. 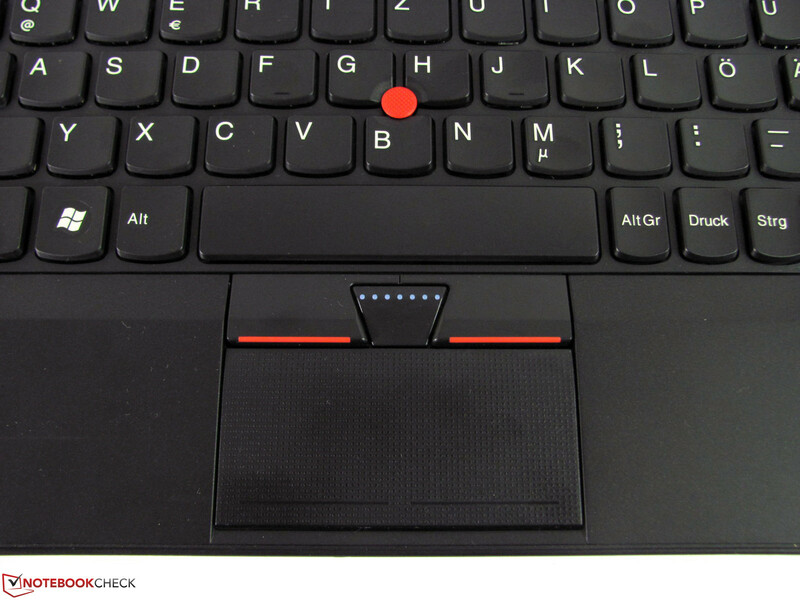 Hence, you are better off using the precise track point with its well aligned keys or a mouse on the X121e. 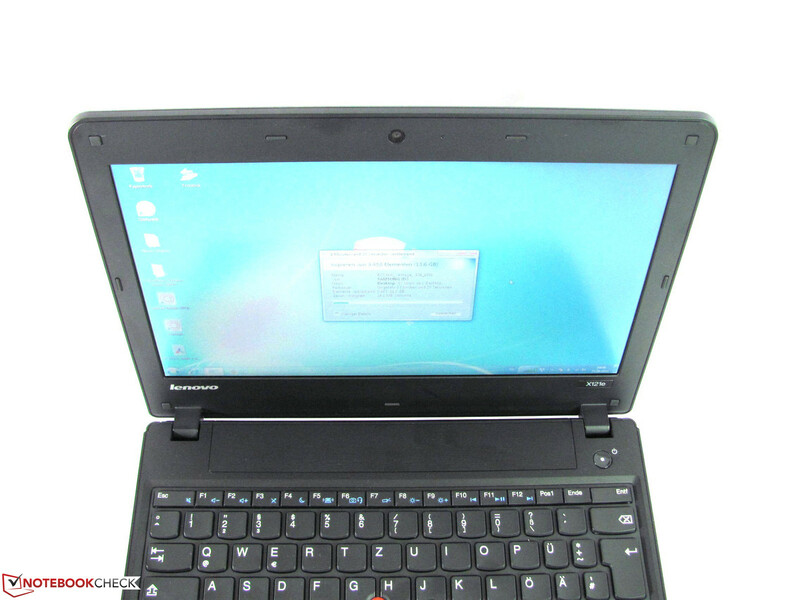 For the display, Lenovo offers no choice; an 11.6" 1366x768 pixel display panel with a non reflective surface is used. It features LED back lighting and a density of 135 dpi. Screen elements could be too small for some users at this display size, but adjusting Windows' display scaling to 125% should counter that and yield good results. 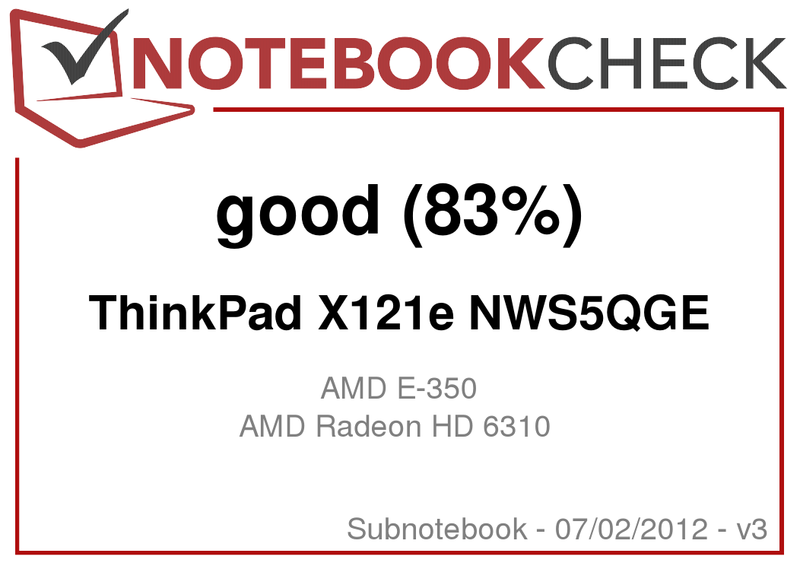 In the comments for the test of the ThinkPad X121e with Intel-CPU (U.S. model), it was pointed out to us, that there are units with a considerably lower display brightness than our test sample scored. Our current candidate delivered values of 176 cd/m² up to 208 cd/m² at our usual nine measuring points. This enables a solid range for usage and the illumination at around 85% was good as well, showing no variations in brightness that would be detectable by the naked eye. Thanks to the non reflective screen surface, you can forgo the maximum brightness setting and choose an economical setting of 140 cd/m² to 160 cd/m². In the great outdoors, displays can't be bright enough. Here, the 190 cd/m² average brightness suffices if you choose your position well, towards the sun or in the shade, for adequate recognition of screen contents. On bright days or in direct sunlight, the display can't defy the sun anymore and reaches its limits. When running on battery, the display is dimmed slightly in the center to 192 cd/m², which is hardly noticable. The low contrast of 163:1 does have a negative effect; black text does not stand out from white background, because it produces grey tones rather than real black and white. Colors are faded causing pictures and videos to look underwhelming. Color space is far below the sRGB color space at 61%, and with that, only offers the often seen standard notebook display fare. Viewing angles are also of entry level quality. Vertically, the image fades or inverts pretty fast. 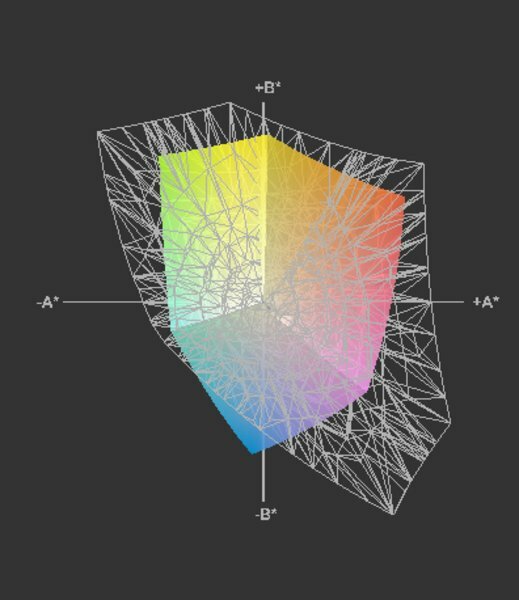 This effect gets stronger with increasing angles, making display contents unrecognizable. Optimal vision is restricted to a narrow cone of about 15° to 20° in front of the display. Horizontally, objects remain recognizable from the sides; merely changes in brightness and color have to be expected. Like all currently available pre-configured AMD models, 0ur test model sports the AMD Fusion E-350 APU, containing a dual core CPU, GPU and memory controller. The processor is clocked at 1.6 GHz and sports a 1 MB L2 cache (2x 512kB). This CPU does not offer hyper threading or turbo boost. At least the integrated Radeon HD 6310 with UVD3 video processor and 80 Shader units is pretty potent for an integrated GPU and can accomplish many of the usual tasks. 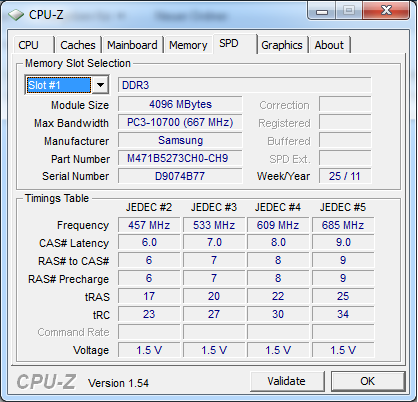 The GPU core is clocked at 493 MHz and uses shared RAM as usual. According to the spec sheet, the memory controller disposes only a single channel. 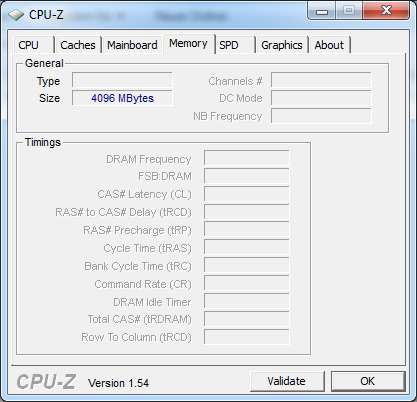 Since there is no dual channel operation, different RAM configurations should have no effect on performance. We performed several tests in that regard and will come back to this subject later on. 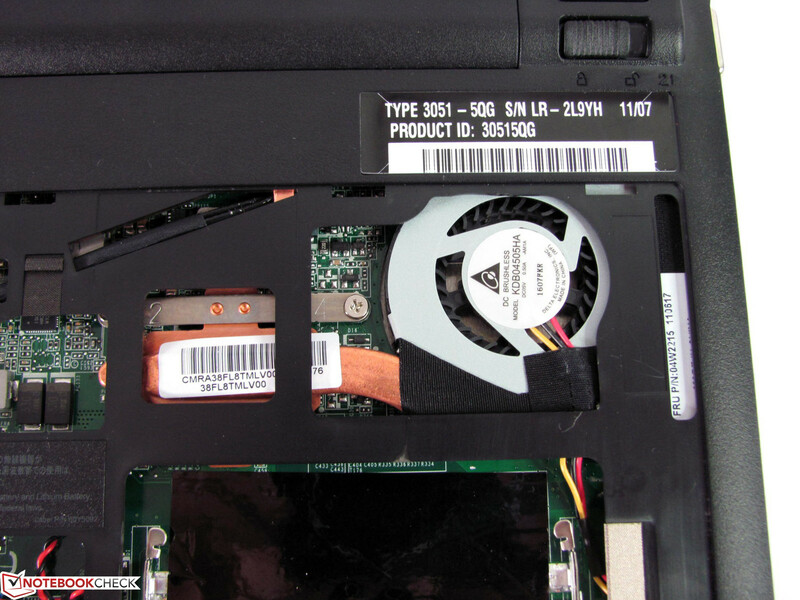 The alternative configuration with the AMD Fusion C-50, available in Lenovo's online shop, sports a nearly identical setup, but was optimized for a lower thermal design power (TDP) of 9 Watt instead of 18 Watt. 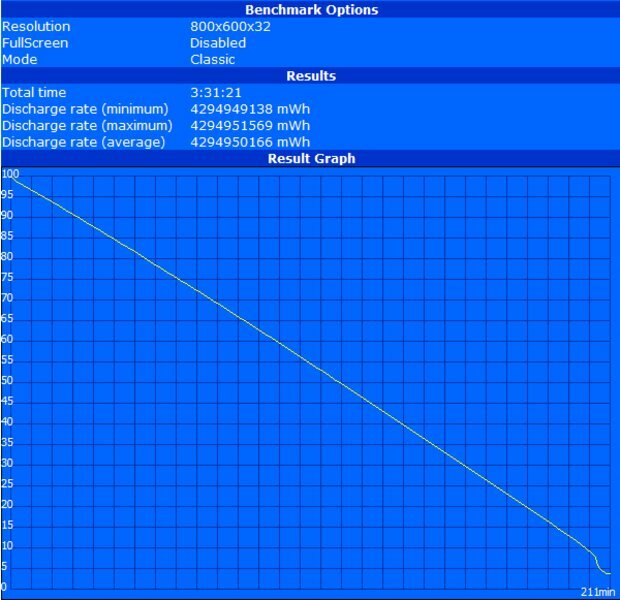 Thus, the CPU is clocked at a mere 1 GHz, and the GPU (HD 6250) tops out at 280 MHz. 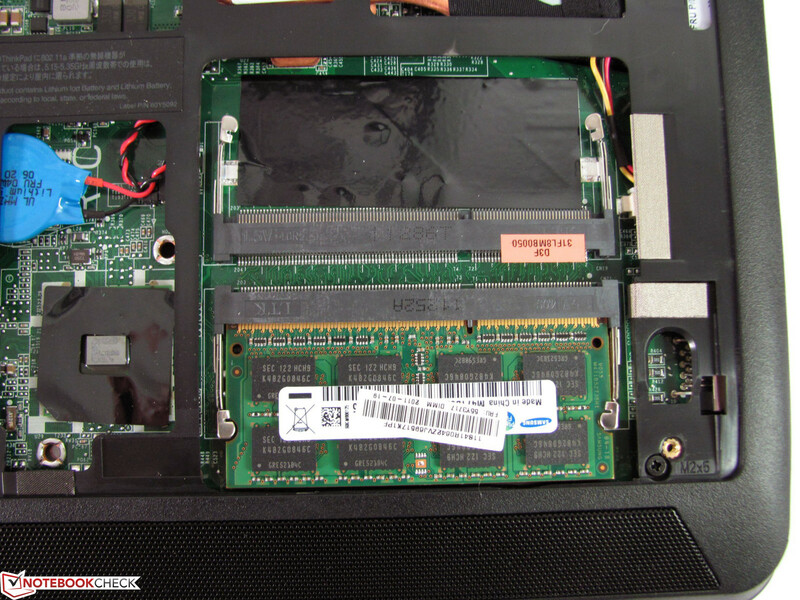 Performance should be comparable to an Intel Atom Z550 CPU, we tested this combination in the Iconia Tab W500.The Fusion C-50 APU could be an alternative for those who seek a cool, (probably) silent computer with long battery life, in trade for lower performance. The E-350 APU equipped in our test system provided relatively good performance numbers. The pure CPU benchmarks Cinebench R10 (1158 Points single, 2196 Points multi), Cinebench R11 (0,61 CPU), wPrime 1024m (2057s) and SuperPi 32m (2427s) bear witness for relatively good processing power, but can't touch the considerably better numbers of the Intel Core i3-2357M CPU. But, in comparison to the similarly priced Atom based competition a noticeable performance increase is evident. This GPU further improves this performance increase. The Radeon Radeon HD 6310 trounces the Intel GMA 3250 used in Atom systems. With 2035 Points in 3D Mark06, 720 Points in 3D Mark Vantage und 1881 Points for Cinebench R10 OpenGL Shading, the Intel solution is solidly outclassed. In a direct comparison to the X121e with an Intel HD 3000 GPU the AMD GPU has to raise the white flag though; With 2962 Points in 3DMark06 and 1158 Points in 3DMarkVantage, the HD 3000 surpassed it by a wide margin. In usability tests with various applications, the subjective results were good. Office, internet and communications tasks were processed fluidly. Stutters and holdups were not encountered. Editing pictures we took of our test notebook went without a hitch, with the swiftness we are accustomed to. Using iTunes, we converted MP3 songs to AAC format with 11.1 fold speed. To re-encode video from our test movie "Seven", using Cyberlink's MediaEspresso 6.5, we only needed acceptable 4643s (77 min), thanks to the E-350 APU's hardware support. However, that brings the processor load up to 99%, so the system is pretty much blocked. 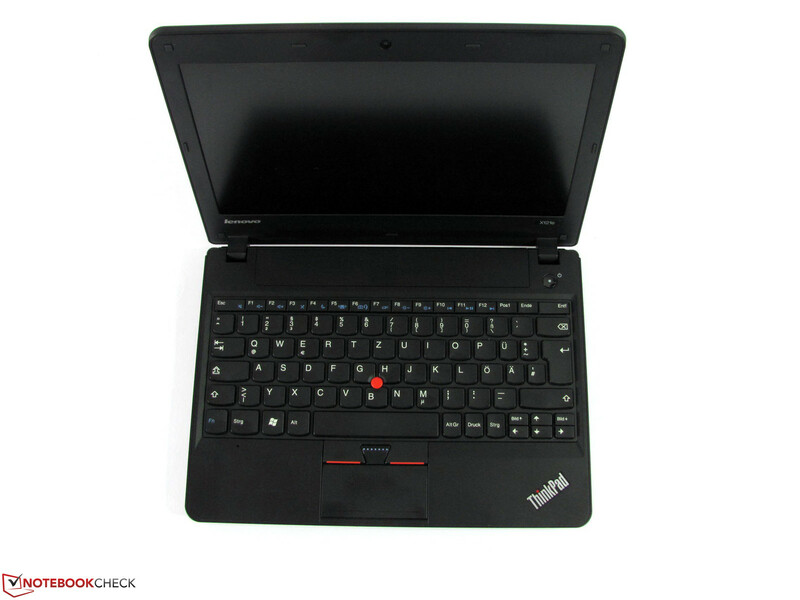 Our Lenovo ThinkPad X220 needed only 1540s (25 min) for the same task, using the Intel HD-3000 GPU and Quick sync, requiring only 41% processor load. HD movie material can be played back fluidly with the Radeon HD6310 in various resolutions up to 1080p. 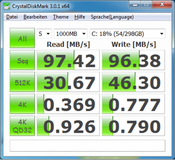 We tested Quicktime, WMA, h.264 und mp4 files u.a. mit dem Media Player Classic Home Cinema. Big Bugs Bunny (h.264, 1920x1080), for example, ran with a proceccor load of 23%. This overall positive impression of system performance is confirmed by PC Mark Vantage's result of 2354 points. 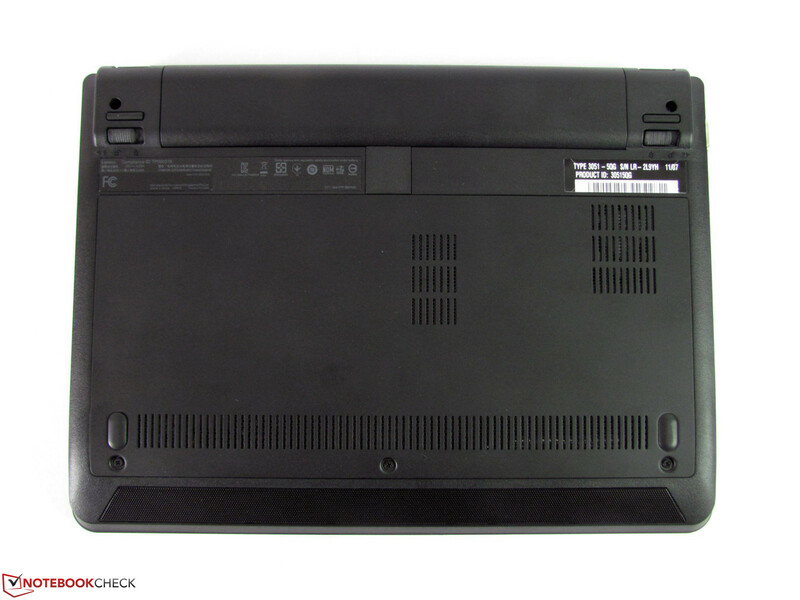 Performance is head and shoulders above classic netbooks, but outclassed equally by the Intel version of the X121e (4170 points). For the usual tasks in this class of notebook, this is without effect, since we don't feel bitten by any drawbacks. Some tests, including Cinebench Shading, PC Mark and 3D Mark, we also conducted with RAM upgraded to 8 GB. Since the AMD system only commands one memory channel, we ended up with the same results, within the frame of measurement precision. Adding a second memory module only helps tasks with need for much RAM and unlike Intel systems, affords no performance boost. 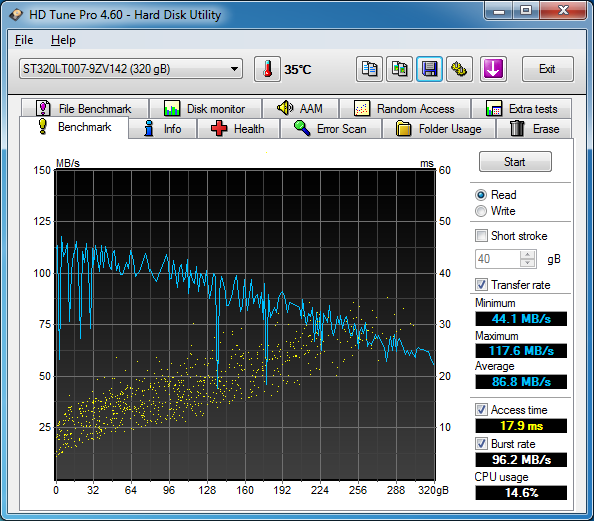 A 320 GB Seagate hard drive serves as mass storage in the X121e. 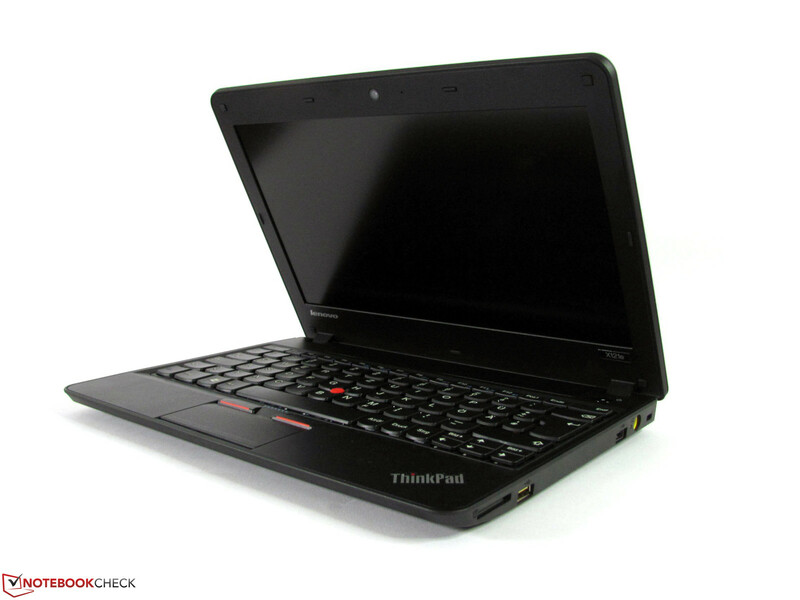 It features 7200 RPM and a 16MB cache. Results are above average, with a maximum of 117.6 MB/s read transfer rates and offers high performance for conventional hard drives. On average, the unit still achieved 86 MB/s and access time is the usual 17 ms. 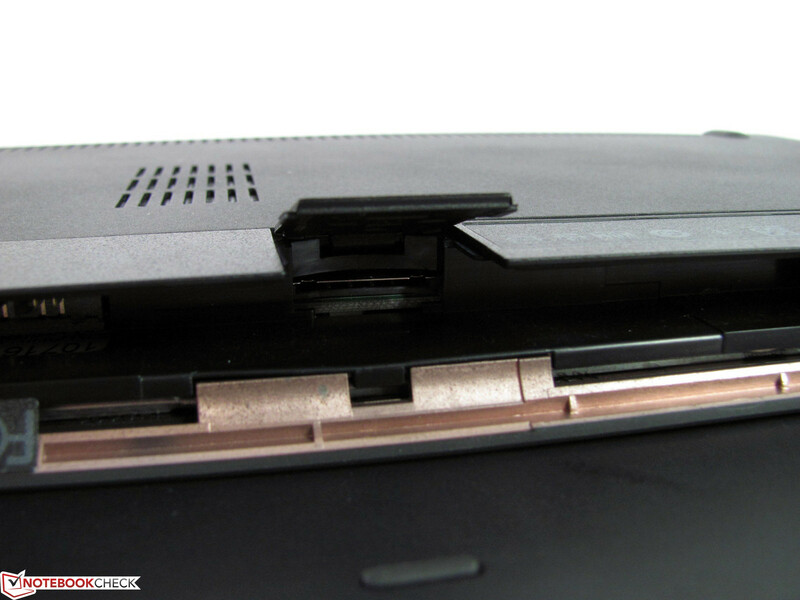 Alternative mass storage is hard to find, because Lenovo uses 7mm thin drives. 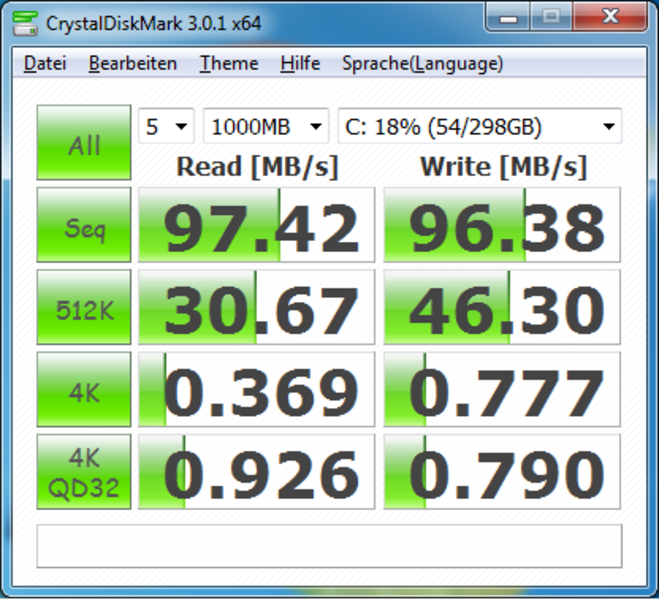 Selection is very limited and capacities of more than 320GB is only possible with SSD's (Intel 320) up to now. 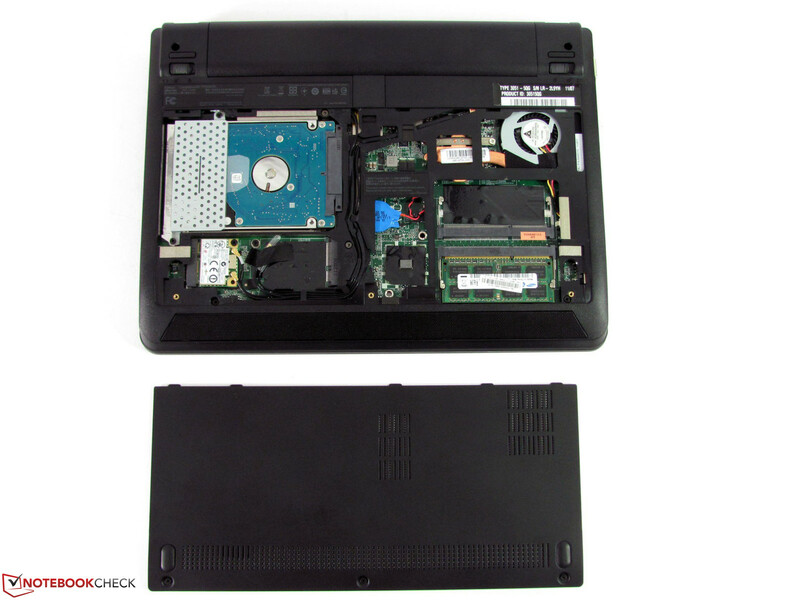 Those also offer noticeable performance increases and replace a hard drive motor's humming with near silent operation. Undemanding games in low resolution and low quality settings can be played fluidly. But the otherwise visible eye candy is not in evidence and the display ends up framed by black borders. For the occasional diversion, that might be acceptable, but for frequent gamers its pretty useless. The fan turns continually with a sonorous but noticeable background din. 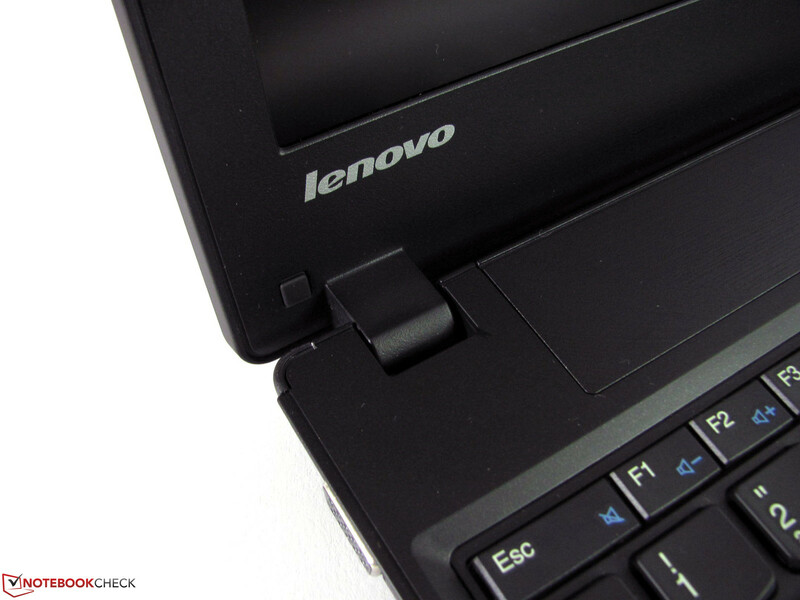 Overall, Lenovo's fan control seems to only know 2 speeds. At idle, we have a constant 32.5 dB(A), under medium and full load, measured noise increases to 34.4 dB(A) and 34.6 dB(A). 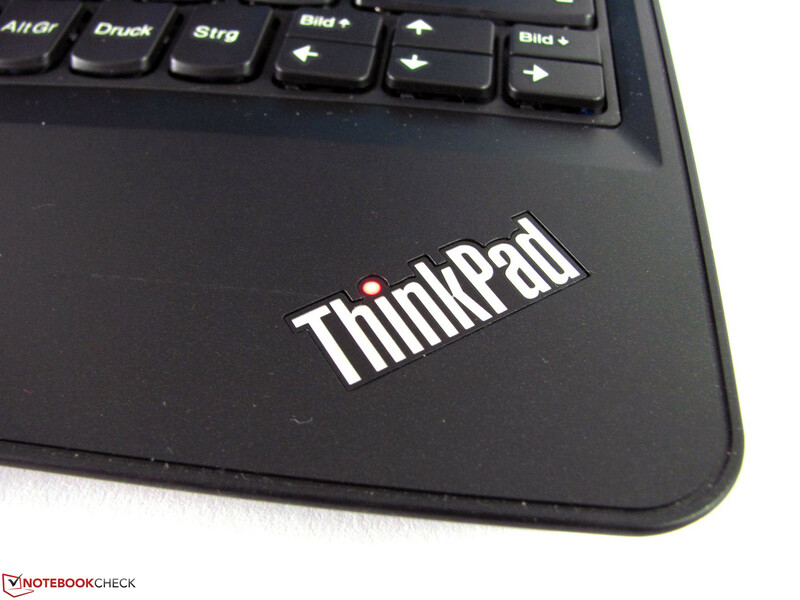 At your own risk, you can influence fan activity with the tool TPFanControl, already familiar to ThinkPad users. Here, you can make your own settings or use the available smart-mode presets. 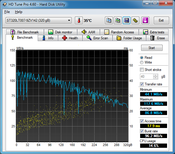 With Fan setting 0, only the motor of the 7200 rpm hard drive is audible at about 31.8 dB(A). But then, internal temperatures rise to 64° C (147°F) with minor load, or 48° C (118°F) at idle. While the X100e from earlier tests broke the 40°C (°104F) barrier in some areas, even at idle, our current test model remains noticeably cooler. 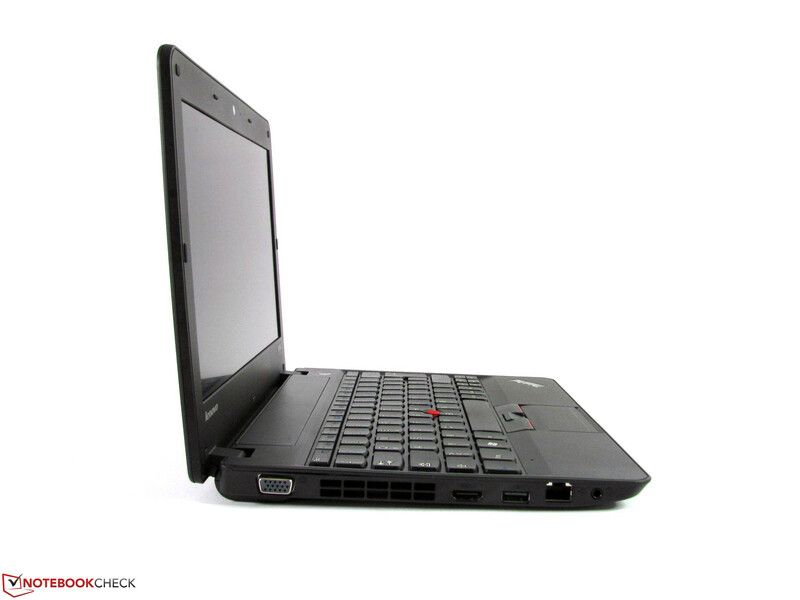 At idle, we measured temperatures of 26.7°C (80°F) to 30.8°C (87°F) on the unit's surfaces, and after an hour under load, temperatures did not rise beyond 36.3°C (97°F) - compared to the X100e at 61°C (142°F). This is a 24,7°C (76°F) difference between the two models. Hence, overheating damage or burns on your skin while surfing on the sofa are unlikely. (+) The maximum temperature on the upper side is 34.3 °C / 94 F, compared to the average of 35.8 °C / 96 F, ranging from 22 to 57 °C for the class Subnotebook. 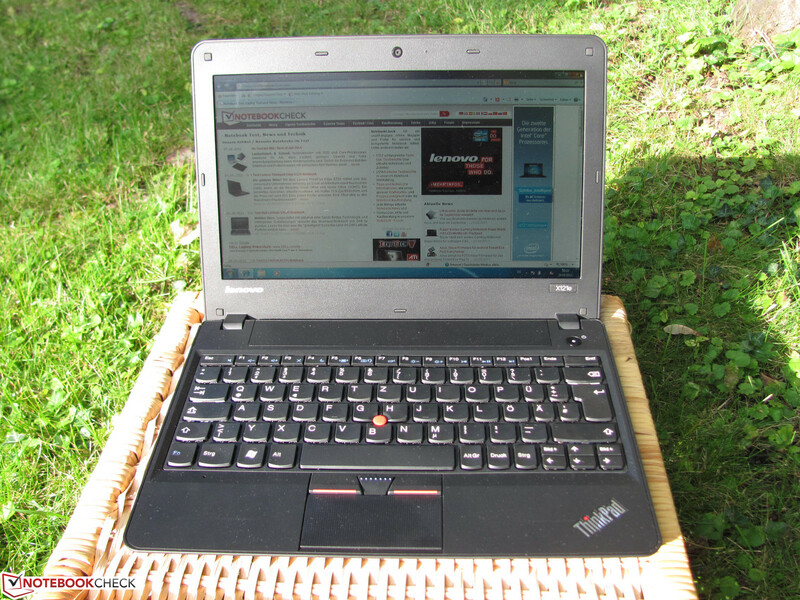 (±) The average temperature of the palmrest area of similar devices was 28.6 °C / 83.5 F (-1.5 °C / -2.7 F). The combined audio port is bad for users of older headsets, because they can't be used without adapter. On the other hand, newer headsets finally can be used without adapter. The treble heavy speakers fail to evoke much enthusiasm as well, they only serve the most basic needs. While this is forgivable for an office-, sub-, or netbook, the first point is more of an issue to skype and headset users. 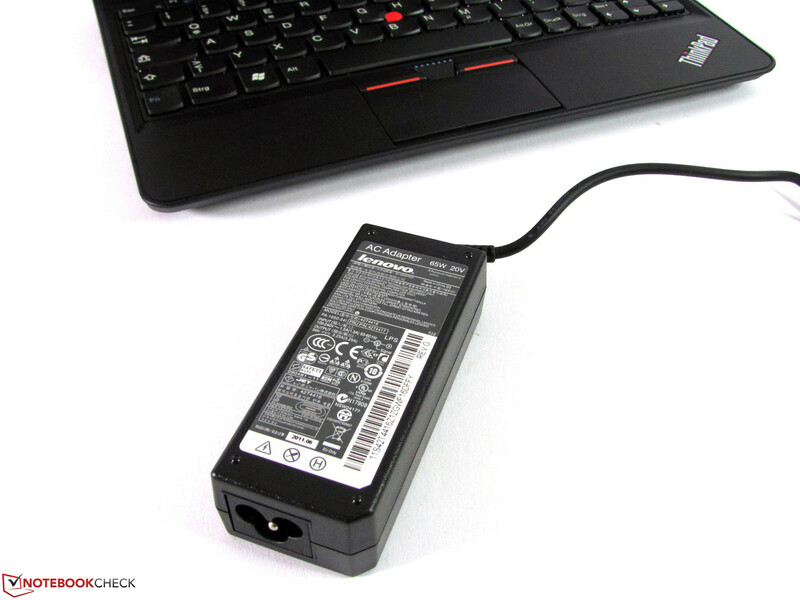 The ThinkPad X121e can be configured at Lenovo's online shop with either a 3 cell battery (which seems to only be available during the system's configuration and not as a separate accessory), or a 6 cell battery (63 Wh, 0A36292). Separately, the 6 cell battery sets you back 120.- euros, the price increase from the 3 cell battery is just under 16.- euros, during system configuration in the online shop. 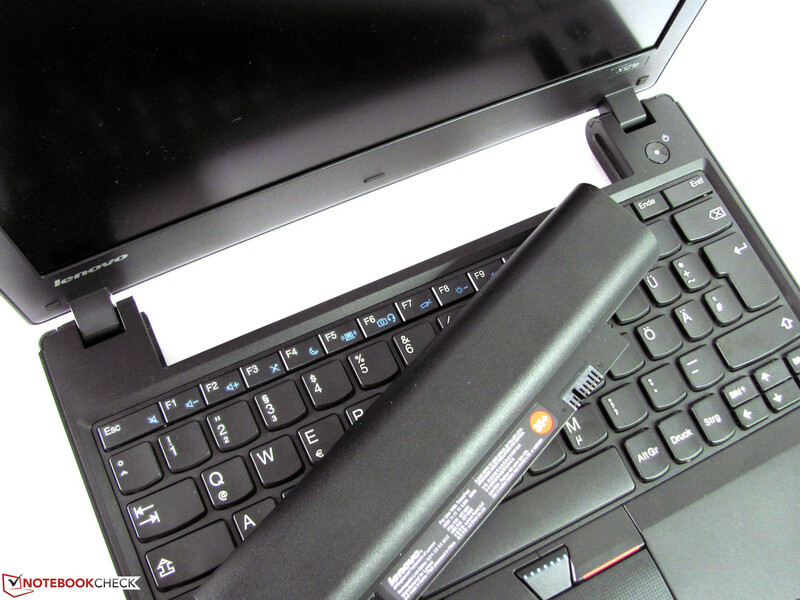 Our test model sports the bigger 63 Wh battery, which makes an important contribution to the good battery life. An equal contribution is made by the power consumption we measured. 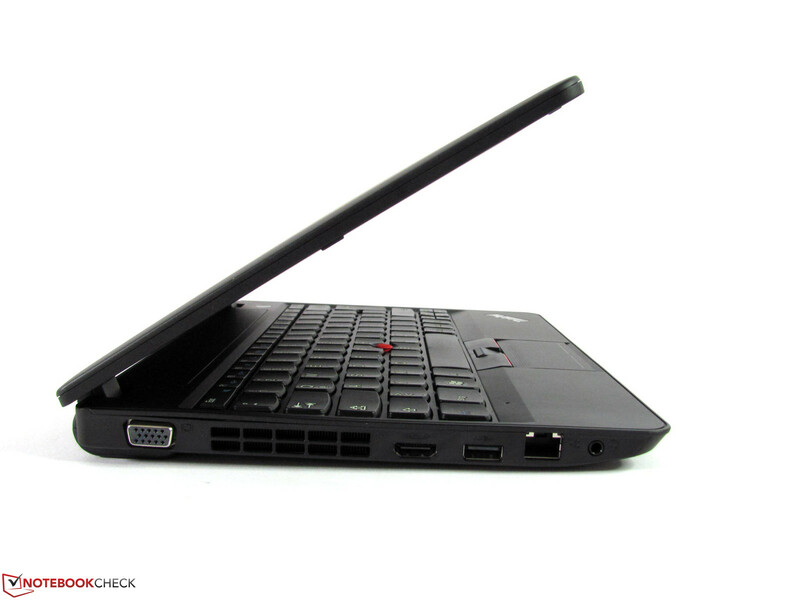 With a minimum of 6 Watts (minimal brightness, energy saver profile, WIFI deactivated) up to a maximum of 24.2 Watts (maximum brightness, maximum performance profile, WIFI on), the X121e remains frugal in all modes. Both factors had a very positive effect on battery life. With the Battery Eater Readers Test (minimal brightness, energy saver profile, WIFI deactivated), we achieved a runtime of 677 minutes. 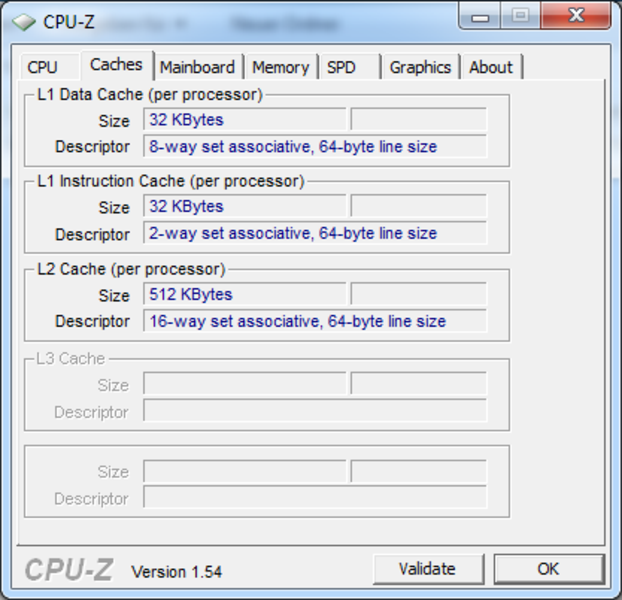 With these settings, the CPU is clocked at 800 MHz and the GPU runs at 280 MHz. Because the notebook wasn't useable with the minimum brightness setting, we repeated the test with maximum brightness and activated Wireless modules, which reduced the runtime to 498 minutes. When conveniently surfing over WIFI, we were left with 432 minutes. 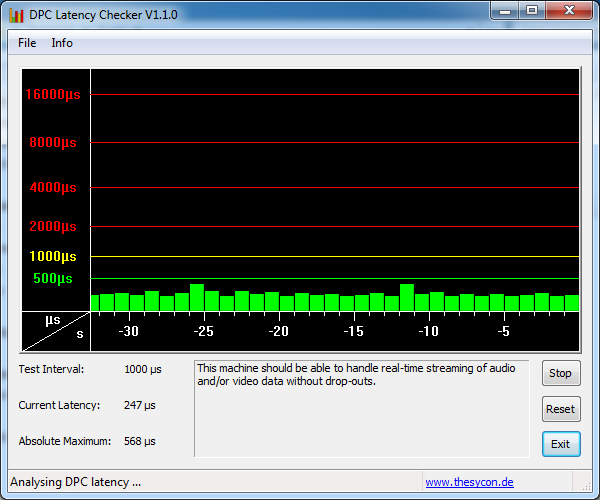 Stutter free playback of a DVD video from the hard drive, using the MPC Home Cinema Player (28% CPU load) ran for 316 minutes. 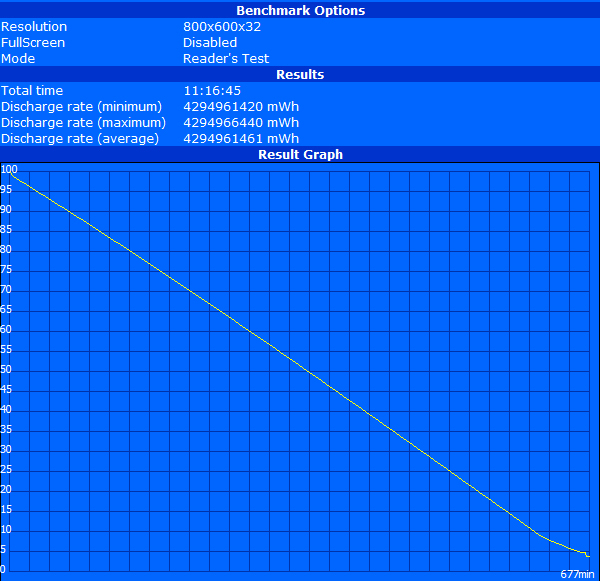 The Battery Eater Classic test (maximum brightness, maximum performance profile, AMD HD6320 max. performance in battery mode, WIFI and Bluethooth on) could still reach 211 minutes, and rounded out our battery tests positively. 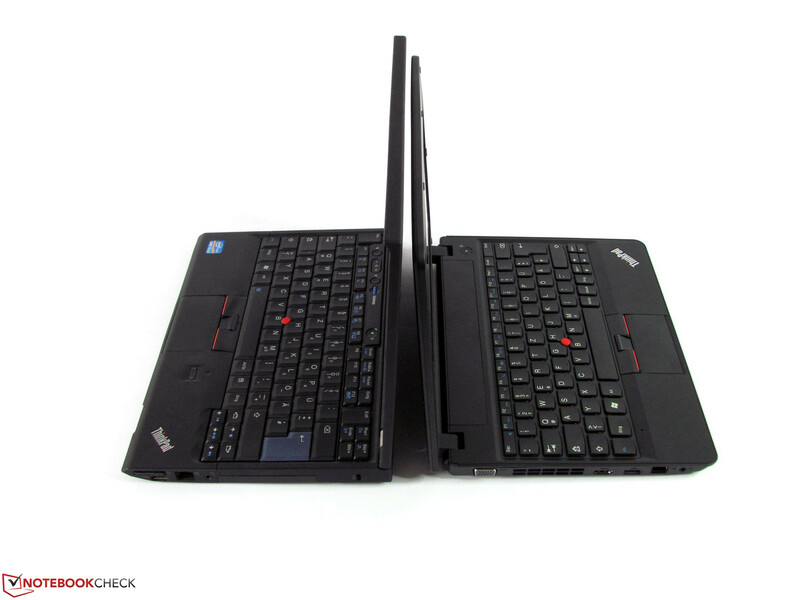 The Lenovo ThinkPad X121e could not match the case qualities of the X-series, but reached a competitive level, that compares with many subnotebooks. 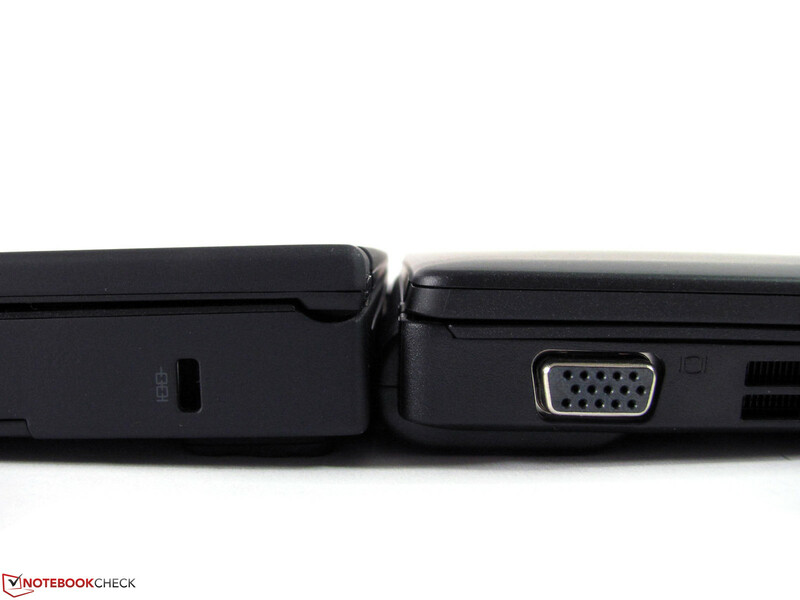 The installed interfaces cover a wide spectrum, though connector positioning is partly unfavorable, which may cause issues. Also unpleasant is the relatively high noise level under minor load, but in return, the surfaces remain very cool. Performance ranges between netbooks and entry level Core i3 systems. HD videos play smoothly, office tasks can be conducted fluidly and without problem and the speedy hard drive offers sufficent space for data with its 320 GB. Playing games is possible, but only at low resolution and low quality settings. The matte display offers good brightness and is evenly lit. 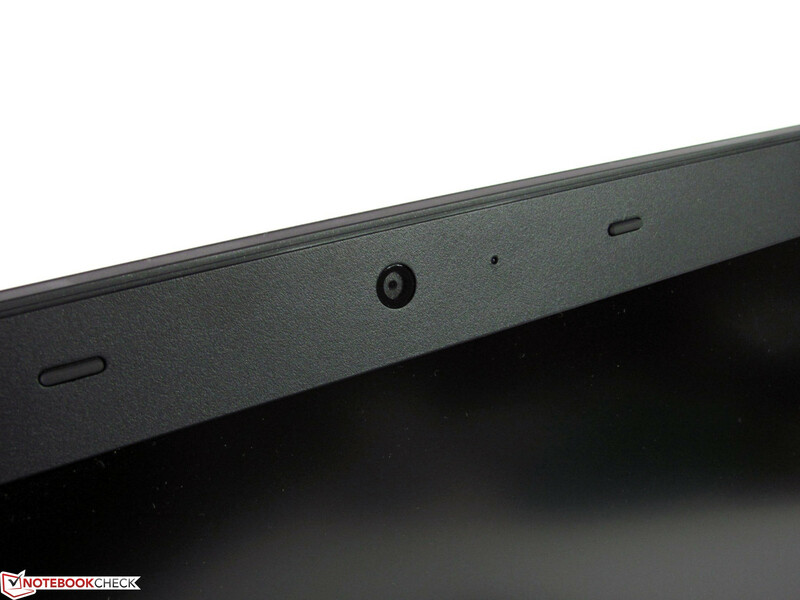 Contrast and viewing angles are on the same level as common notebook displays. The greatest advantage has to be the high level of mobility for an 11.6" notebook. With realistic runtimes of more than 7 hours and a weight of 1.54 kg (3.5 lbs), you will find it to be a solid companion that keeps on ticking, without increasing the size of your bag too much. 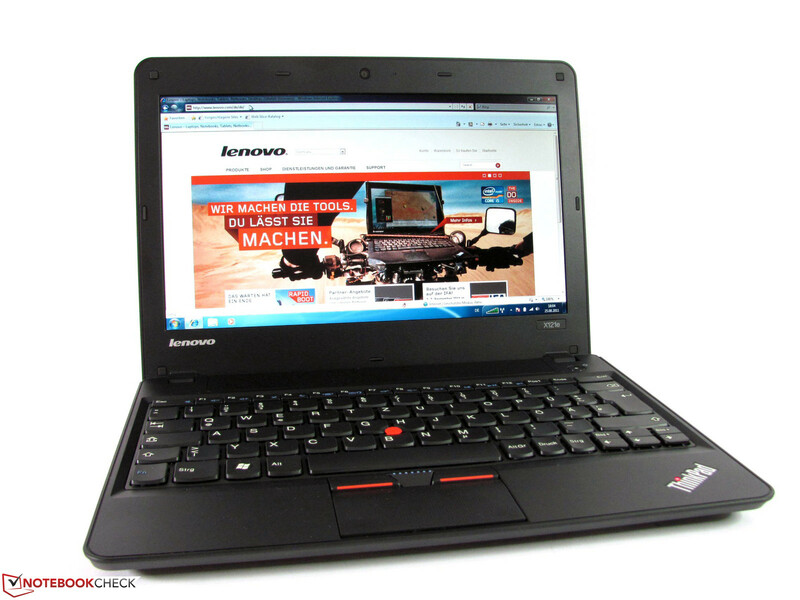 Overall, the entry level ThinkPad offers a lot of performance, features, battery life and upgrade options; at current prices below 400.- euros, it is unique in this combination and price range. 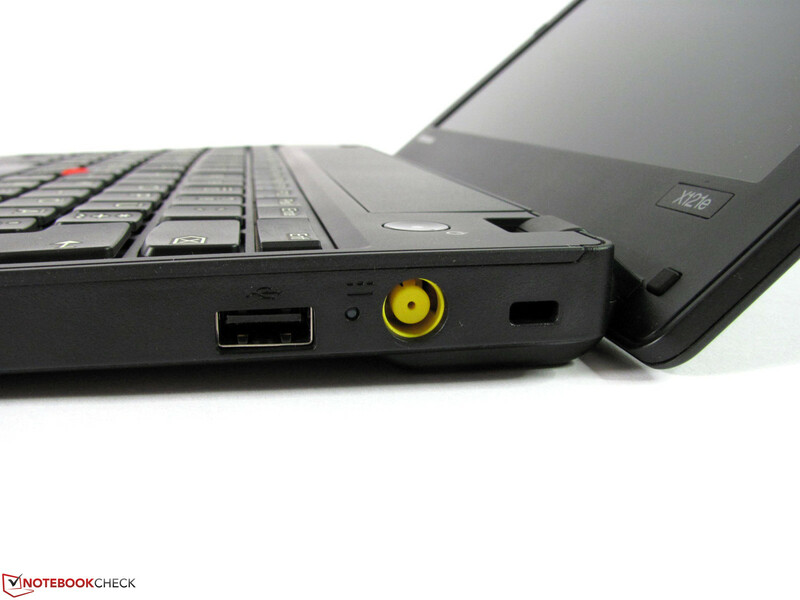 the yellow USB connector charges even with the notebook off. 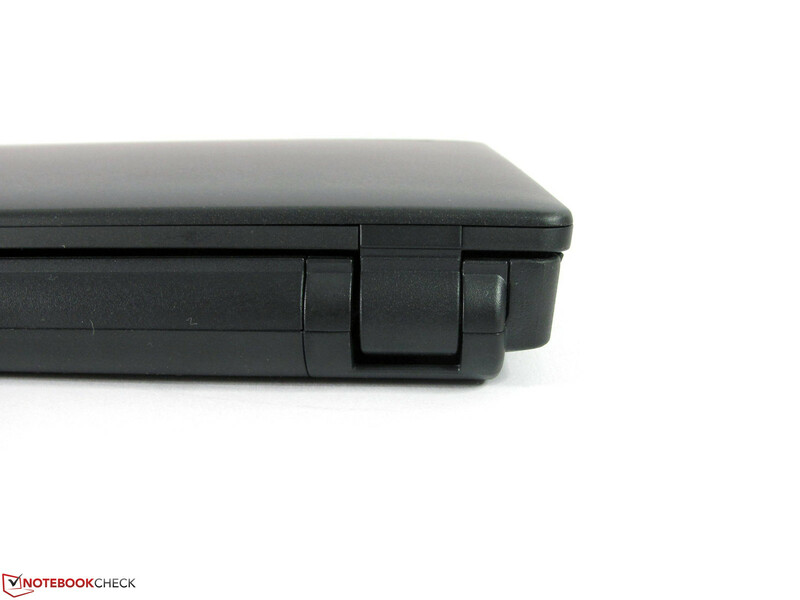 Rubber feet keep the unit stable with the battery taken out. under the large access cover, you find everything you need. 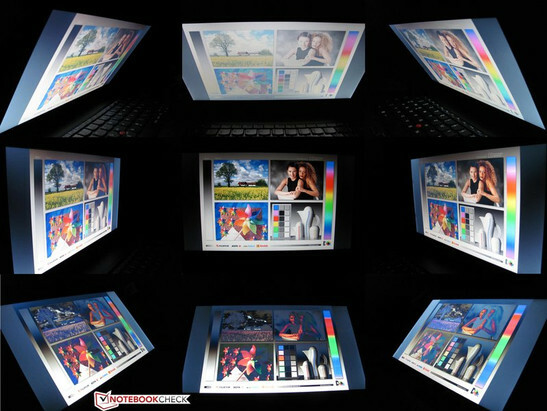 A display with better contrast and viewing angles, less noise with minor use. 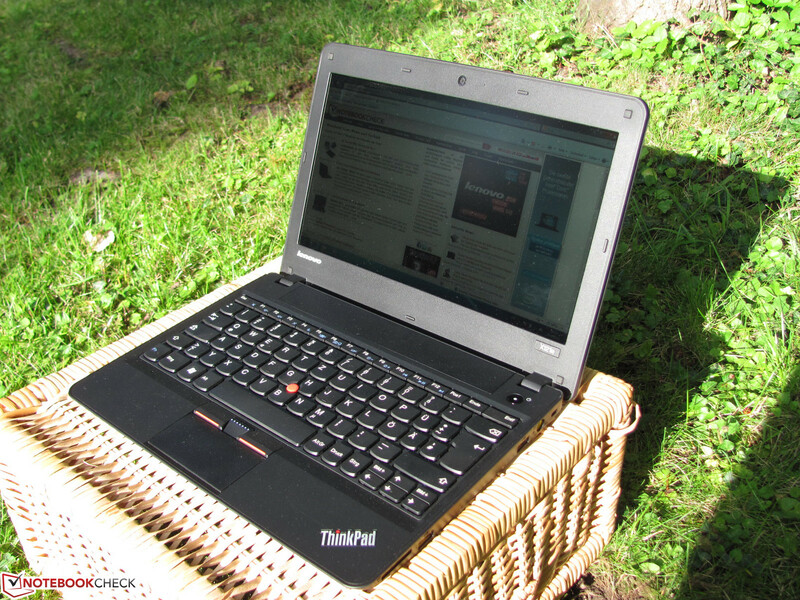 The ThinkPad X121e AMD Fusion version can handle a wide spectrum of tasks. 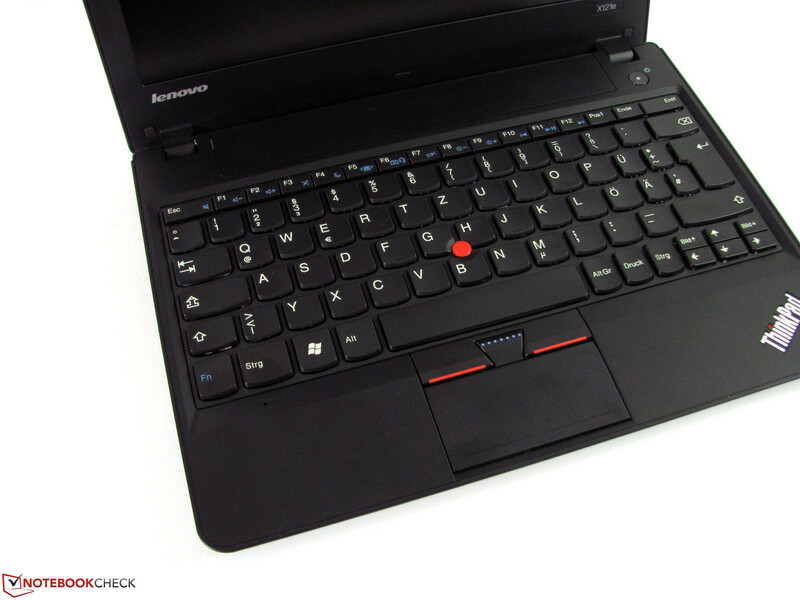 The ThinkPad X121e (matte display) is unique in its current form. Hence, its competition originates mostly in-house. Edge 11 and X100e currently on sale, X121e with Intel CPU and Acer has the Travelmate 8172 in the race.